Deed restrictions, also known as restrictive covenants, are commonplace in real estate law throughout Texas. In some cases, they may adversely affect the ability of a homeowner or commercial property owner to make modifications or improvements to their land or structures thereon. Although deed restrictions are private agreements, they are recorded with the county in which the property is located and remain in force even after the property is transferred to a new owner. Any person entitled to benefit under a restrictive covenant is entitled to sue to enforce it. Many deed restrictions are imposed, initiated and/or required by HOAs. Deed restrictions generally exist to limit certain types of development within a defined area, such as a residential subdivision or historic neighborhood. In particular, they often limit localized commercial or industrial development or activities with the aim of preserving a neighborhood’s quiet character and supporting residential land values. However, they may also impede smaller-scale commercial activities that do not have an impact on the character of the neighborhood in question. Accordingly, deed restrictions are an important aspect of corporate law and factor prominently into business planning activities. Generally, restrictions travel with the deed and cannot be removed by new owners. As such, it is critical for property buyers to understand the nature of any deed restrictions that apply to properties under consideration. In some cases, deed restrictions remain in force for an indefinite period of time. More commonly, restrictions have an effective lifespan of no more than 30 years. After its expiration, a restriction must be renewed by written agreement to remain or re-enter into force. Homeowners facing unwanted or egregious deed restrictions may have legal options at their disposal. 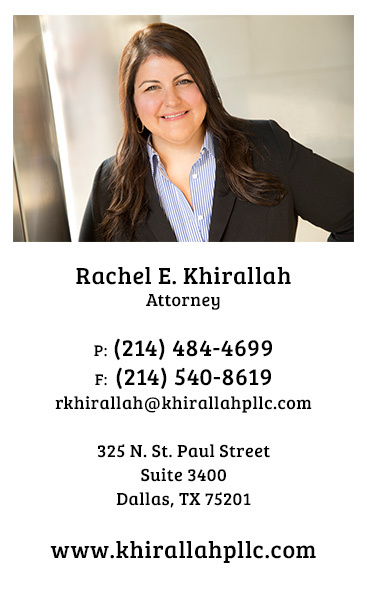 Ms. Khirallah has extensive experience with this legal matter and is equipped to challenge HOAs or condo associations when warranted. Additionally, she can advise and assist homeowners who wish to revise or enforce deed restrictions from their HOA agreements or other governing documents. She understands that there is a delicate relationship between neighbors yet recognizes the need for aggressive representation to enforce compliance. Whether you are an independent homeowner in Plano or a Dallas entrepreneur who wishes to engage in reasonable commercial activity in a residential area, she is happy to evaluate the merits of your case and assist in any way she can.